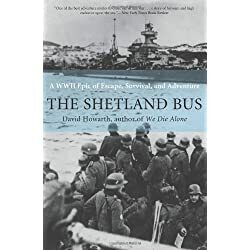 During World War II, the “Shetland Bus” would go across the North Sea to occupied Norway, to take supplies and saboteurs into the fjords under the noses of the Germans, and to take refugees to safety on the return journey. This is the story of those secret wartime missions. Buses can’t ride on water. But the Shetland Bus did. David Howarth paints a vivid picture of the heroism and bravery of Norwegian folk during the Second World War. The Shetland Bus fishing boats ran the gauntlet of German occupying forces in Norway to keep the resistance supplied with arms, equipment and the all-important communications radios that kept the Germans on their toes throughout the occupation, forever wondering where the resistance were getting their supplies from! We may not have been on those little fishing boats crossing the violent North Sea between Norway and Shetland in midwinter storms, but the author paints a dramatic picture of the bravery of those souls that wanted to keep hopes of freedom alive for ordinary Norwegians. Through fantastic tale-telling we can build an image in our minds of the Norwegian fjords surrounded by majestic deep-frozen mountains, little villages clinging to the fjord edge, and the amazed faces of village folk when they realise that the famous Shetland Bus has been near where they live. You may not be into wartime tales (I’m certainly not), but this is one I think most people would find both moving and inspirational – and if that inspiration took you to visit Shetland or Norway, then what’s the harm in that? We can celebrate the liberty that the Shetland Bus eventually brought to Norway! And if you do visit Shetland, look out for the Shetland Bus memorial in Scalloway town centre. This entry was posted in Orkney & Shetland and tagged Shetland. Bookmark the permalink.